The first result of my "DOOM 3 exercise" discussed at the Doom3world forum was pointed by PlanetQuake on a news item and a picture of the day. 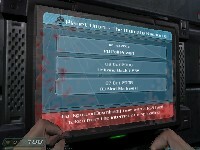 This example demonstrates the use of an RSS feed and Doom 3 GUI for displaying the PlanetQuake news in-game. Interaction between a game and a website is my hobby horse. 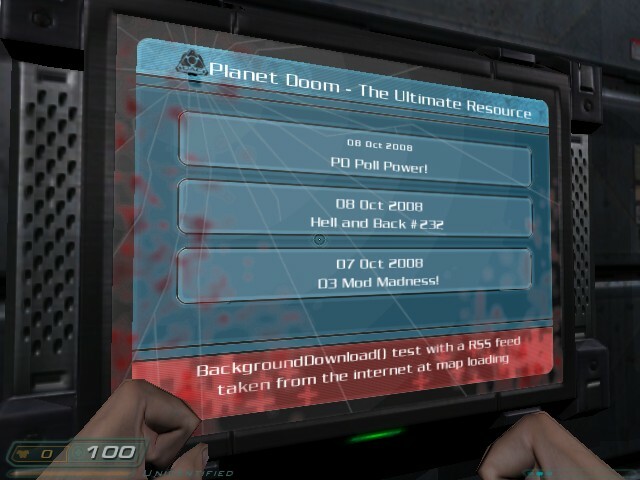 In fact, doing it with the DOOM 3 SDK was easier than expected, as all the necessary API was already available. Big data from *.pk4 + small Patch from website = dynamic fresh content. 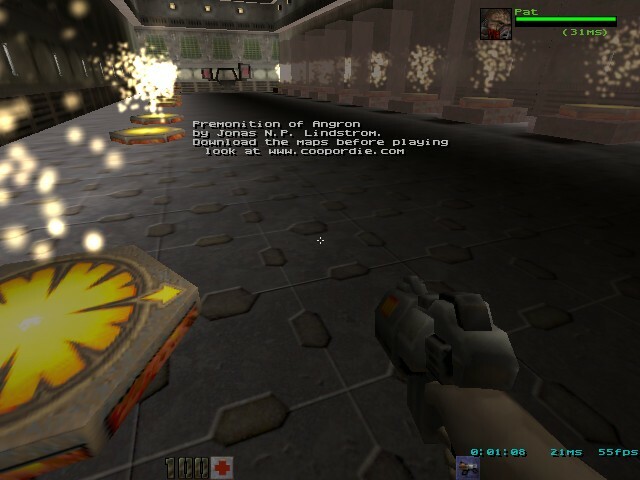 A WorldServer like COOP or DIE for Quake2 and a login/account system are on my todo list. I have reinstalled Steam on my PC as of today. I've just taken a look at the catalogs, and decided to purchase the id Super Pack. I've already bought some of the products included in this package in the past (Quake3, Doom3 ...etc). But I'm ashamed to admit that I have never paid for Quake1 and Quake2, that's the limit! This has now been corrected . I can now replay all the IdSoftware historic games: Wolfenstein 3D, Doom II, Quake, Quake II and the two mission packs and even the ancestor Commander Keen! As "DOOM 3 Resurrection of Evil" is also included, I will be able to try it after finishing the Doom 3 campaign. I have looked at the community tools provided by Steam, and of course I have joined the existing coopordie group. I have also joined the Co-op Coalition group that seems to have several very interesting people in it. I reinstalled Doom3 on my PC at the start of August. In the past, I never finished the solo campaign, so I thought this might be a good idea for spending my nights on vacation. While playing, an idea came to my mind: this game could be a really suitable base for coopordie2. In the middle of the month, I read John Carmack's QuakeCon keynote related to the DOOM 3 game that will probably be open-sourced next year. This information has slightly changed my opinion about the IdTech4 technology. So I have started to learn more about the SDK. 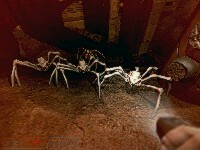 I am currently looking at every aspect of modding Doom3, the game code, but also mapping, modeling, scripting ...etc. My goal is to have enough knowledge to be able to compare the pros and cons of using Doom3 instead of Tremulous, as a base for coopordie2. The coopordie website and the WorldServer have been merged with the new phpBB forum since February 14. The result is a more united community and an increasing number of games played, particularly games with three or four players. Finally, while waiting for the next DLL release planned for the end of the summer, I have added a teleporter in the StartMap for a new mission pack. The "Premonition of Angron" from Jonas N.P. Lindstrom was chosen for its high quality and great fun for co-operative play. This website has been completely redesigned today. The difference is not actually visible at first sight, because it is more a content re-organization rather than a visual change. The HTML code is now W3C compliant, the URL and pages titles are more pertinent. A big effort has been made for making the job of Mr Google and other search engines easier. The Coop or die 2 page is currently the main place for information about my new project. Working on a new project entirely dedicated to co-operative play with my WorldServer technology is not new. I already had this goal in 2002 with the "War against the cyborg" project, powered by the Quake2 GPL engine and Steve Yeager's AceBot. In 2005 I also attempted to put it into practice with a tank game using the Max Shelekov's models and the GarageGames's Torque Engine. These two projects were canceled by the amount of work needed and the lack of progress. But the big moves in the free game scene over the last years have made my project a lot more viable. Initially I considered re-launching the "War against the cyborg" concept as an OpenArena modification. Finally the Tremulous game seduced me more. The quality of the media (models/textures/maps/sounds) and the "humans vs aliens" theme has really pleased me, even if the initial lack of bots was a problem. But due to the Open Source nature of the Tremulous project, third party developers have already started to release some promising bots, and I'm sure there is more to come. The Tremulous Bots Index is a sort of reminder about everything related to the development of computer bots for the Tremulous game. I will keep this page up to date as much as I can. If you are reading this, it's worked. This website is now sharing the host of coopordie.com. I will be able to integrate a news and comment system merged with the coopordie phpBB3 forum. What? I'm late? Nooo, it's still January, so it's the last day for wishing you a Happy New Year 2008. I especially wish you a lot of fun playing cooperative computer games with your friends, your neighbors, your family and every cool person you can find over the Internet. Have fun fragging side by side and enjoy reaching common goals as a team. 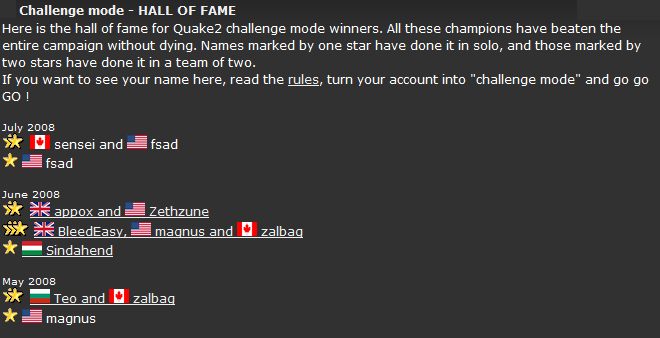 The end of the year 2007 was a little disappointing for the GPL Quake development community. 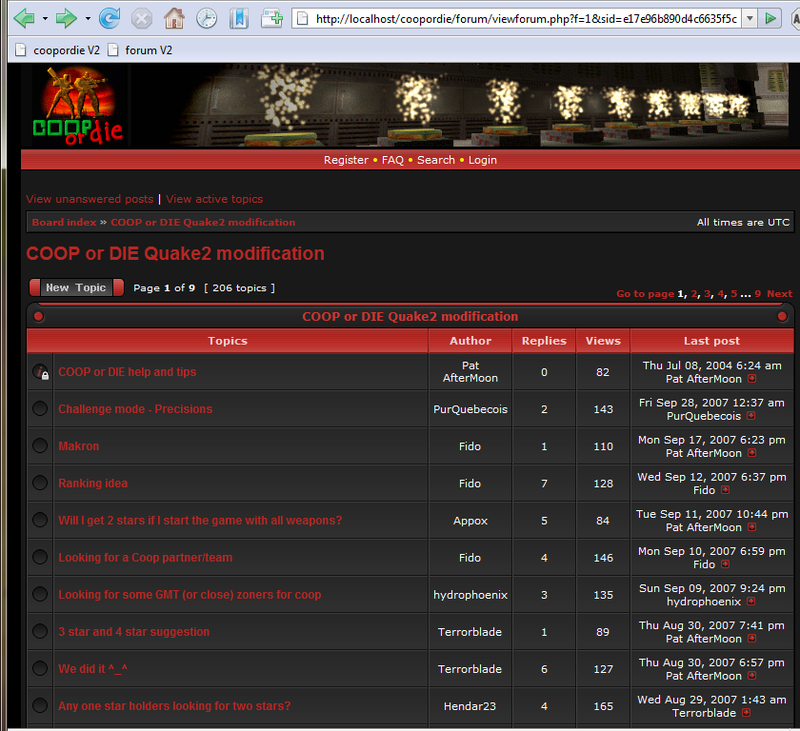 Quakesrc dot org, our central forum was unstable during one month, and finally went down at the start of 2008. Ender, the admin, has given no sign of life since the end of November. He never sent me the database export of the old COOP or DIE forum. Fortunately, between Christmas and the end of the year, I have grabbed the entire COOP or DIE sub-forum HTML pages. After nearly 10 hours of hard work, an extensive use of regular expressions and text processing, I have re-imported the complete forum content. Of course with a correct database export it could have taken 30 minutes, but I have learned a lot about the preg_match function and text manipulations under PHP. For testing wether messages were correctly imported, I re-read a lot of old thread, it's always fun and surprising to dig into the past. Finally, I'm now porting the entire COOP or DIE website and the WorldServer to PHP 5, and I will be able to release it very soon.